Georgia State student Peter Pimentel addresses residents and representatives of Atlanta at the Capitol. These words came from the steps of the City Hall in Atlanta and from the mouth of Peter Pimentel, a Georgia State student and community navigator for Welcoming Atlanta, the Mayor’s Office of Immigrant Affairs. 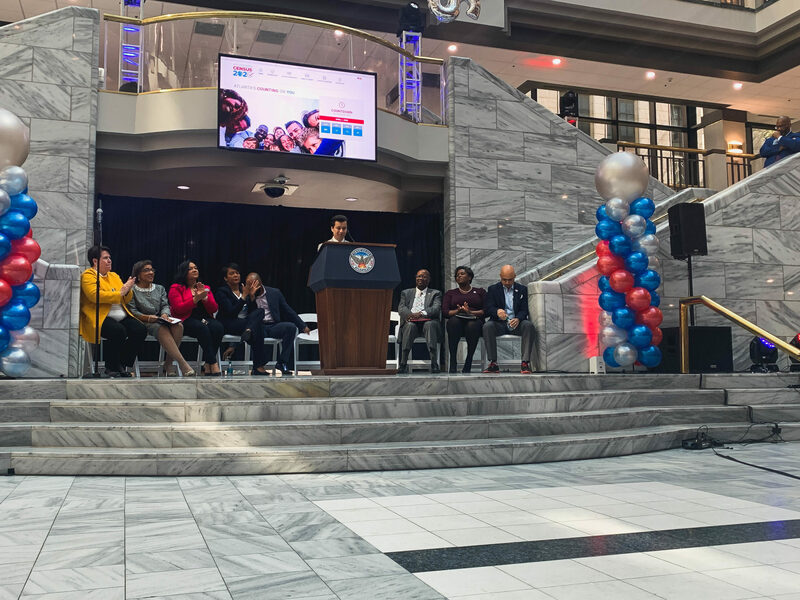 Pimentel urged the 129,000 students living in the city of Atlanta to get counted in the campaign for ATL Counts announced by Mayor Keisha Lance Bottoms the morning of April 1, National Census day. Throughout the community rally event, this sentiment was echoed by representatives, supporting citizens and members of the newly created Atlanta Complete Count Committee. But what is the census and why do these officials want student participation so badly? Every ten years, the census is completed on the national level, the last being in 2010 and the next in 2020. As outlined by many on the announcement panel, the census is used to determine funding, district lines and number of representatives on all levels of government – national, state and local. According to Bottoms’ counts, Atlanta has the opportunity to pull in $100 million extra in funding toward government programs, including anything from free-and-reduced lunch in schools to better paved roads. Nationally, the census was brought to light by a tweet from President Donald Trump earlier that morning. The City of Atlanta panel didn’t hesitate from responding, specifically from Jerry Gonzalez, executive director of Georgia Association of Latino Elected Officials (GALEO) and founder of the Georgia Latino Complete Count Committee. The 2020 census will be the first to be available digitally in an online format. Pimentel argues it’s the youths’ responsibility to guide the older generations in this process. “We need to be sure that all of our younger brothers, sisters, cousins, tías, tíos and comadres are also counted by educating our families and communities,” he said. In this, he sees an opportunity to reach not just one, but two communities. As for Georgia State students specifically, Pimentel outlined the importance of participation after the event ended. Pimentel said that his passion for the topic is influenced by an intersectionality between being a voice for the Latinx community and for the youth.